Each month, Shiner receives a PetBox to bark about as part of her PetBox Spokesdoggy contract. She also has the opportunity to give away one free PetBox (for dogs or cats) to one lucky Pawsitively Pets reader. Her favorite time of the month is when her PetBox arrives in the mail. For those unaware of what PetBox is, they are a monthly subscription box filled with goodies like food, treats, toys, grooming products, and more for your pet. 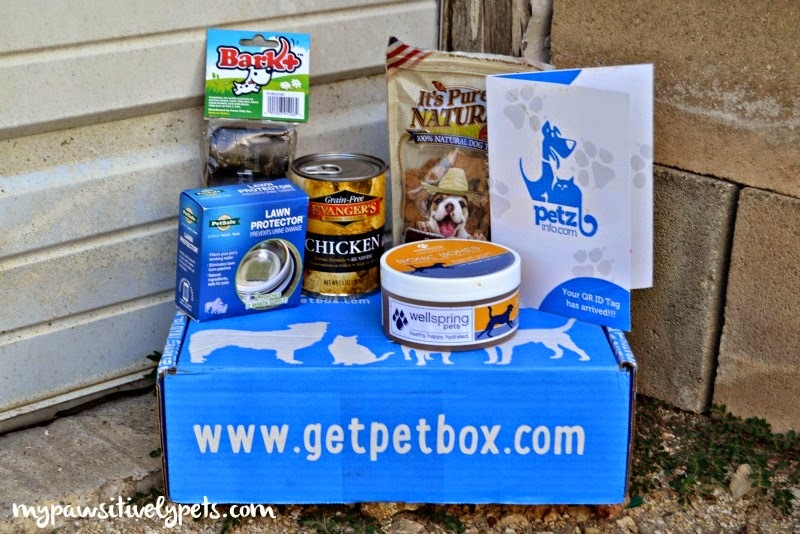 PetBox offers several different subscription plans no matter what your budget is like. PetBox subscription plans range in price from $9.95 to $59.95. Our September PetBox contained lots of interesting pet products. Shiner has already tried a few of them out and is pleased. Here's a peek at what we received in our September PetBox. 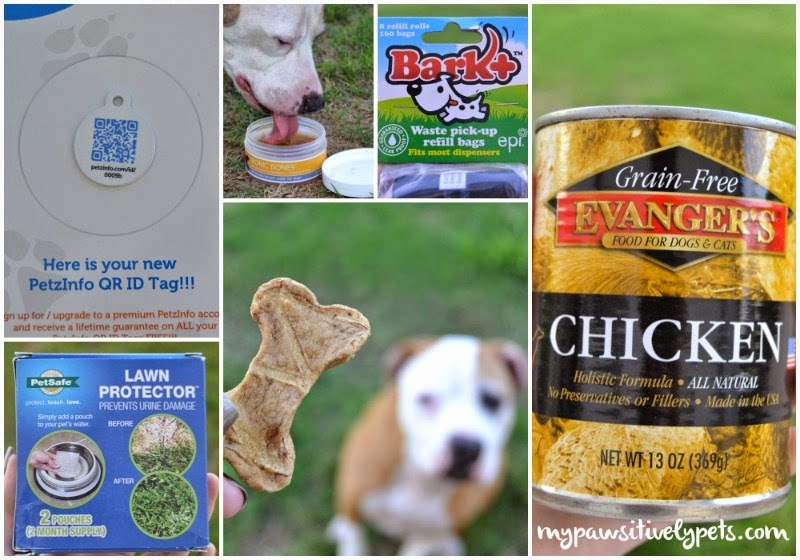 PetzInfo QR ID Tag - These tags are easy to scan with a smartphone or tablet. You can input all of your pet's information onto a PetzInfo profile and if the ever become lost, the tag makes it easy to reconnect the two of you again. Bionic Bones Nutrient Water - This tasty drink is made by Well Spring Pets and is a delicious way to encourage your dog to drink more water. It is all natural rotisserie chicken flavored and includes chondroitin and glucosamine. Shiner loved her Bionic Bones Nutrient Water. It was one of her favorite pet products from this month's box. Bark+ Waste Bags - A great way to Scoop That Poop. These waste bags are biodegradable! Grain-Free Evanger's Chicken Canned Food - Shiner can't wait to dig into this for dinner. This food looks great and is made in the USA. PetSafe Lawn Protector - This product helps prevent urine scald patches on your lawn. You simply place one of the "pucks" in your dog's water or fountain, and it purifies your dog's water. This product works by removing excess nitrogen from your dog's water, which is what causes the urine scalding spots on your lawn. It's Purely Natural Chicken Jerky Treats - These treats are shaped like a bone and a little crunchy. Shiner thinks they taste delicious and these are another favorite of hers from this box. They are also made in the USA. For our friends who are interested in trying PetBox (and we do think you should) we have a special discount code. Save 10% on your PetBox order by using the code "PAWSITIVELY" at checkout. You can visit www.getpetbox.com to order yours today. They are available for dogs and cats. 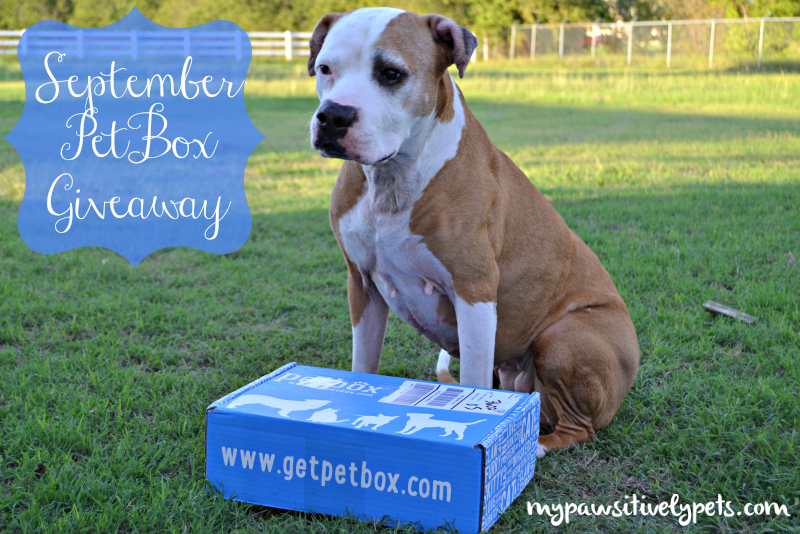 As promised, we have a PetBox giveaway! One lucky reader will win a PetBox for their dog OR cat. This giveaway is open to US residents age 18+ only and ends on Tuesday, September 30th at midnight CST. To enter, just fill out the Rafflecopter form below with as many options as you like. Good luck! We receive a PetBox for free each month in exchange for our honest opinion of the service. That water seems like it would be pyrfect for when the fluffies are feeling under the weather. Encouraging a sick dog to drink isn't always easy! That looks like some great stuff! I'm curious about the can food as well as all natural jerky! Nom nom nom! Dog. jaxon and Olivia loved their Pet Box they won last time. keepz puttin off chekin out ther site....we can see we will hafta take computer inta R paws... !! That is one fun bunch of goodies Shiner! What an awesome giveaway. We have three English Shepherds that would love a gift box, but I think our cat Traveler would especially enjoy one. Hey Shiner - I'm loving those poop bags :) I see you've already tasted the water, did you like it? Oh yes Harley! She thought it was great! Cat. I didn’t like anything in my box that I won from Blogpaws but I want another one anyway. So there. Hey, maybe better luck this time? Too bad it's not available for your Canadian cousins up north! Yoda says hi! Hi Yoda, good to see ya again! I'm Entering For A Dog! For some reason, the dogs seem to need more "stuff" than the cats, so we'll enter for the dogs this time! You got some great stuff in your box, Shiner! You'll have to let us know how that food tasted. If we win, we'd like a kitty box. I'm entering for my cat! I'd love to win the cat box. I'm entering for my dogs. I'm entering for a cat.